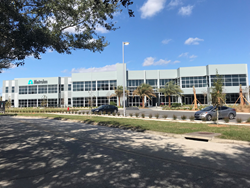 On January 15, Metrohm USA welcomed its Tampa employees to their new U.S. headquarters in Riverview, Florida. Since breaking ground in February 2017, the 90,000 square foot state-of-the-art facility has evolved into a space that exemplifies Metrohm’s continued commitment to its customers and employees. Metrohm’s dedication to the people that use our instruments and those who support them make us who we are as a company. This new facility demonstrates our commitments as we invest in providing our customers with innovative training facilities and our employees with modern work areas. Innovation and collaboration are the major themes that run throughout the entire building, including training facilities for customers and employees, application development laboratories, technical and customer support areas and a 25,000 square foot warehouse. The modern and open layout is intended to enhance creativity and teamwork. The new building is located at 9250 Camden Field Parkway in Riverview, Florida. A grand opening and ribbon cutting event will take place in mid-April in conjunction with Metrohm’s 75th anniversary. Founded in 1943 in Herisau, Switzerland and celebrating its 75th anniversary this year, Metrohm operates in more than 80 countries with its own subsidiaries and exclusive distributors. Metrohm USA is Metrohm’s largest subsidiary, employing 250 people across North America.